Jacqui Oakley was born and currently lives in Canada, but spent her formative years watching BBC reruns and animé in Bahrain, England, Zambia, and Libya. Her illustration work has included editorial, advertising, and book projects for clients like The New York Times, Rolling Stone, Penguin Books, National Geographic, The Financial Times (UK), Amazon, AOL and more. 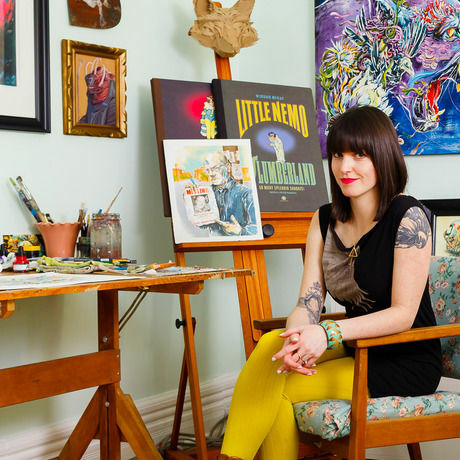 Her paintings have been exhibited in Toronto, L.A., San Francisco, Philadelphia, San Diego and Shanghai and she’s pleased to have won awards from Applied Arts Magazine, Communication Arts, Society of Illustrators of Los Angeles and American Illustration. Jacqui also teaches in the illustration program at OCAD University (Ontario College of Art and Design) in Toronto. Jacqui’s portrait by Jeff Tessier.